In few days I am going for a trip to Iceland, also I have been spending a LOT of time playing Divinity Original Sin 2, hence the progress is not big. But I have some nice mixes! This one is pretty straight forward, I painted the whole thing Yellowed Bone, by Reaper Mini’s (GW Bone Yellow will work even better) and gave a hefty wash with Seraphim Sepia (by GW). I mixed then Yellowed Bone with Seraphim sepia (which is the colour base) to work on some highlights, adding Linen White (GW white would do), keeping adding it to pure white. The shades (the beak in particular and the horn) were done, by adding Dubai Brown (by Scale 75) to the base. Up too pure Dubai Brown. As usually Antares Red was used. Highliths were done by adding white and then glazing over it with Antares Red. Shaded, were done by adding black. I really disliked the shoulder pad – hence I decided to strip the paint from that element and repaint it as bronze. 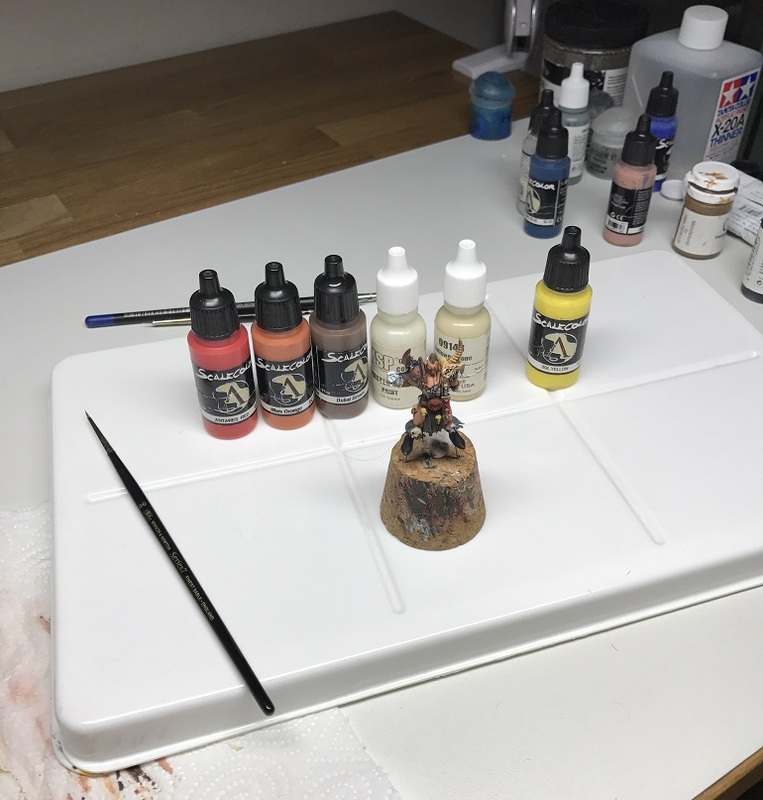 Thing is – I never painted this kind of NMM and I had no clue about how to handle this. I found some tutorials from Sprokets’s Small World (clicky!) as well as Andy Wardle. I am quite happy with the effect, but I am really unsure if I will be able to repeat it. Anyway, this one very, very tricky. The base is Dubai Brown with Antares Red. Highlights were done by adding Yellowed Bone, then glazing with the base colour. Then reapplying the highlight and glazing again. I repeated the process for a few times. Then glazed a bit with yellow. Shades were done by adding Black. The Turquoise parts were pretty simple I used a mix of Turquoise Hawk (GW) and black, going to clear Turquoise. Yesterday I bought the Primaris Reivers set (the three figures one, clicky!) and I will try to spend couple of hours paint job to show some quick paint jobs technics. I also will have a new set of paints, which I will write about in the next few days.